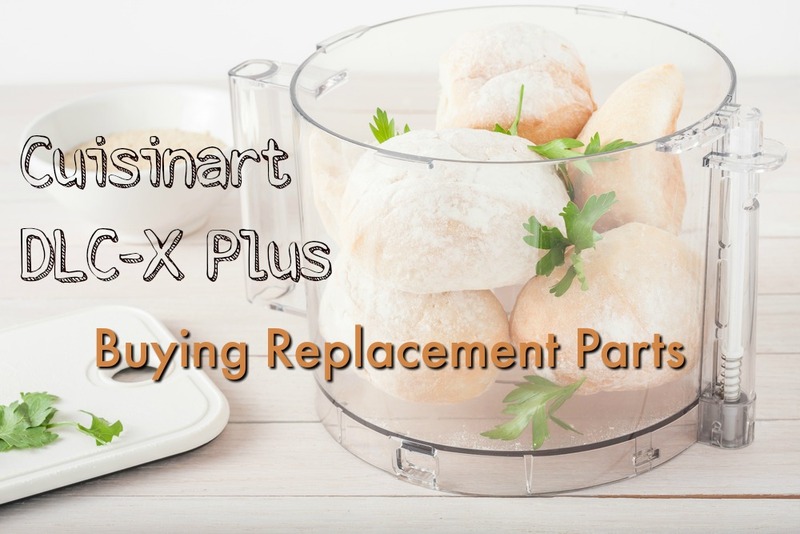 Cuisinart DLC-X Plus – As of February 2016, parts for this specific food processor were already difficult to find. The limited stock of replacement parts is now completely gone. Update a.o. November 2018: This article was originally published in February of 2016 when replacement parts for the original DLC-X were still available in limited quantities but dwindling fast. This model has been discontinued by Cuisinart® and replacement parts are no longer in production. Some parts can still be found on eBay®. I reached for my Cuisinart food processor a few weeks ago to give a few ounces of boneless pork a rough chop. Chinese Pork & Cabbage soup was on the menu. Parts & accessories are still available for many Cuisinart food processors! Unfortunately, I forgot the bowl was cracked. The metal chopping blade seemed wobbly. The cracks in the bowl did not matter because the meat was raw and I was not processing anything liquid. The unbalanced blade, I imagined, could handle the small batch of meat that was already cut into small pieces. The first batch processed without any problem but when I hit the pulse button to process a second slightly larger quantity, the steel blade decided to call it a day. The shaft broke off making it impossible to re-attach the blade to the motor pin. But I digress. Locating and buying replacement parts for an appliance of any size is not an easy task. Kitchenworks® is a the first place to look. Have you ever had to search for authentic replacement parts for vintage or classic small appliances? Last year, I had a similar problem with a classic Sunbeam® appliance. I love my vintage kitchen appliances but nowadays I often wonder how long the newer models will last. Until the next color fad? The next fancy attachment? Some kitchen tools have not changed in nearly a century. Because they work. The Chinois strainer is a perfect example. Every kitchen needs one – it’s the original food processor! Over the years, I have tried to purchase top of line small kitchen appliances when the price is right. Why? Because these appliances last longer, have more powerful motors and come with accessories which also prolong the life and use of the appliance. I purchased the DLC-X Cuisinart food processor more than 20 years ago. It seemed like quite a bit of money to spend on a kitchen appliance back then, but I envisioned myself able to cook up fabulous meals. Thanks to my Cuisinart®, I have. So how did the DLC-X compare to other Cuisinart models? It was powerful enough to knead dough (for my special double-deck pizza), able to slice, dice and julienne all those fruits and vegetables. This kitchen appliance was perfection all wrapped up in a powerful machine capable of tackling just about anything I asked of it. A commercial rated power base that does not travel across the counter when kneading pizza dough. A huge work bowl with an equally large feed tube. It allows me to slice whole apples without having to cut them in half! And it has done just that, without fail, for more than 20 years. Could it be that I prepared one pâté too many? Or pushed it to the max without thinking of the age? But The Base Works Fine! The sad part here is that the base / motor still functions correctly. The 20 cup bowl started showing wear and tear years ago and I don’t remember when it cracked. 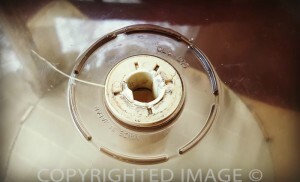 The adventure began when the time finally came to replace the amber colored Lexan work bowl and steel blade. Have you ever tried to replace parts on appliances (large and small) which are considered to be obsolete or at best in the “oh, you still have one of those” category? Along with the cook who can easily be categorized as vintage, my kitchen is full of what are now referred to as classic appliances! The DLC-XPN & DLC-XPBCN are comparable models currently sold by Cuisinart. As with many other purchases, my first thought was to check Amazon. Why? They sell everything or so it seems. I am now accustomed to finding unique items and unusual products on their site. As it turns out, models in the Cuisinart DLC-X series are still available for sale. However, most listed replacement parts are not necessarily compatible with the DLC-X Pro 20 cup food processor. This page lists all currently available replacements parts for the DLC-X series. We called Cuisinart®. While the DLC-X plus is labeled as discontinued on the company website, a helpful Customer Service representative assured us that, in 2016, they still had replacement parts in their catalog for this model. Comparing work bowls – Amber Cuisinart DLC-X Plus versus DLC-305GTX. We provided them with the serial number on the bottom of the base and the model number shown in the work bowl. We Even Called Cuisinart® Customer Service! Apparently, providing the representative at Cuisinart® with the model numbers (as recommended) proved useless. 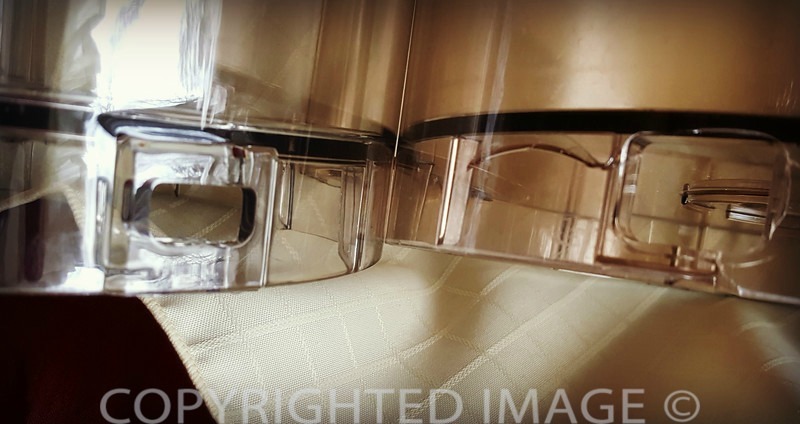 After ordering the Cuisinart DLC-X Plus parts based on his references and recommendations, we received a clear work bowl which did not fit the brackets on the base. We called Cuisinart® again. They are still hunting for the correct parts. It turns out that few merchants now stock the replacement parts for the older classic models. Forget model numbers. Not even the model number on the bottom of the work bowl proved helpful. Sure, you can provide the numbers when requested but when buying new parts, do not hesitate to describe the original piece. I am shopping around for a new food processor! 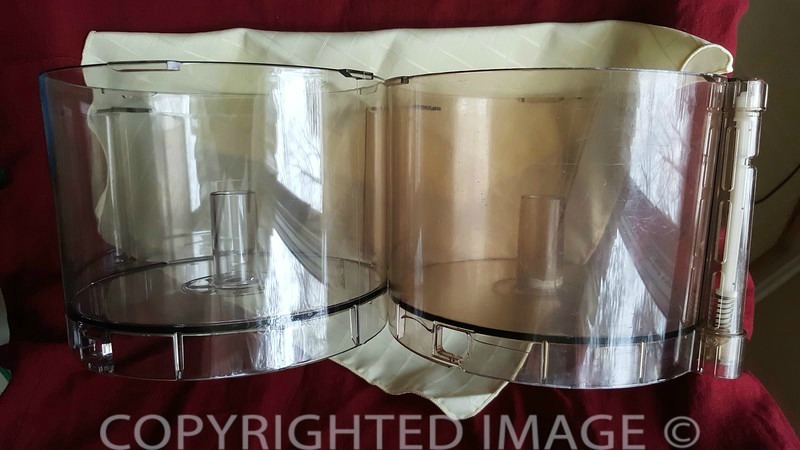 To date, I have only found DLC-X 20 cup Cuisinart® processor parts on Ebay®. As of November 30, 2018, about the only few parts left for this specific processor are entire blade sets, individual blades, blade holders and a base. Replacement parts for newer models can easily be found at Kitchenworks® Kitchen Supplier or on Amazon®. The large oval feed tube! It’s what I consider to be the best feature of my DCL-X. No need to cut potatoes or apples into smaller pieces just to fit int the tube. I have cut full size French fries and whole carrots into shoestrings. I’ve also sliced apples paper thin for pies. A feature I refuse to give up! A shallow space between a slicing/shredding disk and the bottom of the feed tube. None of those odd shaped pieces left over. An S-shaped metal blade – the blade I use the most often – that almost touches the sides of the work bowl. 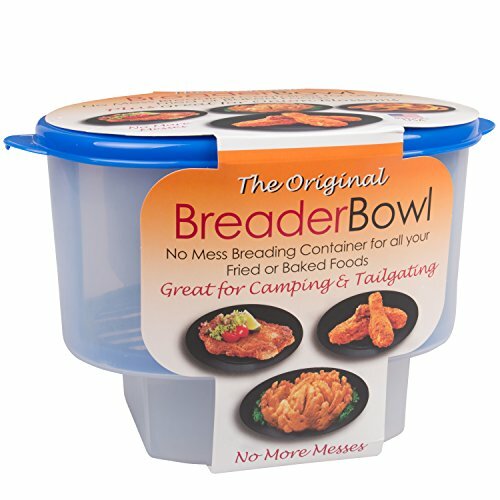 No need to constantly scrape down the sides of the bowl. Cake batter, mayonnaise, chopped vegetables and fruit… everything is automatically sucked into the vortex. Even with a single pulse. A heavy base that stays put when processing meats. None of this walking across the counter. The DCL-X is very heavy. No need for a long list of “settings”. On and off or pulse. Works for me. an S shaped blade that covers the entire bottom of the work bowl. Robot Coupe® enjoys a stellar reputation in France and Europe but for the past 30 years, they have established themselves as a major part of the restaurant/food industry in the United States. Robot Coupe® food processors come in various models and sizes so be sure to check them all out! Definitely at the top of my list for small kitchen appliances in my kitchen. 1.0.1 Parts & accessories are still available for many Cuisinart food processors! 2.3 But The Base Works Fine! 3.1 We Even Called Cuisinart® Customer Service!